AutoTech Communications: where automotive passion meets technical expertise. AutoTech Communications is a knowledgeable and experienced PR and communications agency, with apassion for automotive aftermarket matters and a forward-thinking approach to new digital channels. Drawing on longstanding relationships built over the course of many years operating within the industry, we can provide a dynamic range of PR services to meet each client needs. We manage public relations activity for a growing number of successful businesses in the automotive aftermarket and industrial sectors, generating impactful B2B trade and consumer media coverage. When you have experts like our Patrols at your disposal, it makes sense to draw upon their wealth of knowledge. 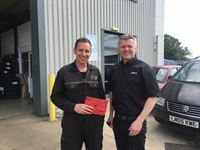 Our Patrols know their local area inside out, and they are familiar with the local garages that deliver the highest levels of service to ensure both vehicle safety and customer satisfaction. These are the garages we want to champion and promote on the Garage Guide website. We had almost every diagnostics brand you could think of visit our stand. Right now there’s a lot of amazement at the level of data and functionality we can deliver through MECH5. The immediate benefit for garages is that they can access MECH5 anytime, anywhere and on any web-enabled device. It’s fast to use, and incredibly stable so we can develop future coverage much more quickly; there’s no reliance on specialist IT hardware which takes a lot of cost and complications away. Demonstrations like this serve two purposes for us. Firstly, they’re a great way to show just how effective our products are. You really need technicians and customers to see in person the impact that accumulated sludge has on engines, as well as the dramatic difference in a car’s performance and driveability after a detox, to really drive the message home. Secondly, workshops also get the chance to know us as a company. We like to keep things simple for our partners, so we don’t ask for any capital outlay; the equipment is supplied to garages on a pay-per-use basis. We also support all of the garages in our network with unique, proven sales training, helping staff to generate incremental sales profit. We encourage anyone interested in learning more about EDT to take a look at our Trust Pilot reviews to see what our partners and customers have to say about us. We’re really encouraged by how well received the changes to the show’s format have been, which I believe is reflected in the volume and speed of the tickets sales so far. We’ve worked hard to ensure that this is our most informative and educational show yet, whilst still giving attendees the opportunity to relax and network at our Gala dinner. I’d encourage anyone thinking about joining us to book promptly, as tickets are selling out fast. Time and time again our partners tell us about the overwhelmingly positive feedback that they get from their customers regarding the vast improvements an engine decontamination treatment can make to their vehicles’ fuel economy and drivability. It made sense that we should use these customers to help sell the service for us. The reviews on Trust Pilot will be completely uncensored and impartial, and we encourage anybody who has experienced EDT’s technology for themselves to let us know what they think. We are undoubtedly seeing the event growing through word of mouth; those that have been before are both recommending it to others or bringing colleagues, whilst returning themselves - and it’s great that garages are beginning to appreciate the positive impact a unique training exhibition such as this can have on their business. We’ve worked hard with exhibitors to create a programme that will suit all visitors and enable garages to really maximise the value they gain from the time available. It’s an honour to be recognised by the readers of Workshop magazine, as these technicians and garage owners are the end users of our products who understand the difference that they can make. It’s yet another achievement in an already fantastic year for the company. The next generation of our state-of-the-art engine cleaning technology will help us to build on the foundations of an already very successful year for the business. We’ve already seen an overwhelmingly positive response amongst our network and a real appetite from motorists for this kind of service, as it’s unlike anything else which is currently available. We’ve even been recognised by the Green Organisation for our efforts in improving sustainability. The new equipment will further enhance all of these achievements, and help people to see significant improvements in their vehicles’ fuel economy and emissions, as well as drivability and performance. 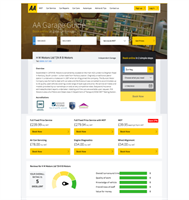 R B Motors is a prime example of a business that has taken the time to ensure that its presence on AA Garage Guide accurately depicts the integrity of the garage. Their profile page is well populated, containing all the information users need to make an informed decision on whether to make a booking. The detailed list of services and associated costs leaves no room for ambiguity, and it is this transparency which really helps to drive bookings. The AA's new Garage Guide is a brilliant platform. It does exactly what it says: it makes it easy for customers to find a high quality garage for their MOT or Service. Garages can quickly respond and manage their bookings easily online. Thanks to the AA, my business has already gained a number of new customers for life. I highly recommend the Garage Guide for both garages and motorists alike. Motorists trust the AA to recommend great garages. Each garage registered with our Garage Guide has to comply with our verification process, which aims to ensure we build on our network by picking only the best garages. Because we’ve taken the time to assess each of the garages listed with us, customers can be confident in the garage they select via our site. This marketing investment to help raise awareness reaffirms our commitment to providing a market-leading platform that promotes only the best UK dealers and garages to members and motorists. The network has grown significantly in recent weeks, and includes many of the UK's best independent and biggest franchised dealer groups, so the time is right to increase AA Garage Guide’s profile through wider marketing and advertising activities. Technicians can now access valuable data like labour times, service schedules and parts RRP pricing. The functionality is driven from our car registration look-up which pulls in this extra data seamlessly through the existing interface. This adds capability to CarVue without layering on any extra complexity, as we know our users value the speed and simplicity of CarVue. One of the many strengths of TecAlliance is our ability to incorporate our data into third-party systems as we have with CarVue. This is only possible because the quality of the data we gather and process into our standardised format is so high. As a result, it makes it easier to integrate the data complementary systems and ensures their accuracy is of the highest standard. So far, 2016 has proved to be a fantastic year for EDT, and we’re keen to expand on the successes we’ve had by making headway in our open points. We want to demonstrate to garages in these locations that our decontamination machines are unlike anything else currently available. To support our equipment we offer unique proven sales training, designed to help staff generate incremental aftersales profit. Demonstrations are no obligation at your location, and will allow you to fully appreciate our unique technology at work. The initial capability is built on 20 years of development of the industry leading DEC Superscan scantool. The OESAA stand was great, as they did loads of presentations highlighting the differences between white box and OE parts. I've been in the motor trade since leaving school and in the past 20 years have seen non-OE manufacturers degrading the quality of parts, as they are sourced from cheaper suppliers. As times goes by, the quality gap between non-OE and OE is becoming greater, and selling OE parts to my customers becomes easier and easier. It confirmed what I have believed for a long time: it’s essential for our reputation that we fit good quality parts that are manufactured to high standards. Once we saw the state of the unit and realised the single most expensive part hadn’t been changed we understood the price difference. The point is this wasn’t a ‘one off’ from a small supplier, it was in a batch manufactured to a supplier-determined remanufacturing standard that isn’t trustworthy. The frustration here was that our product was actually much better value but only if customers realise the difference in quality. This is a very important and exciting time for the business. We’re building on some very strong foundations, having appointed over 2,600 garages to our network, and with the partnerships we have in place with IMI and Motor Codes. Our new home is befitting of the upward direction in which the company is travelling. The root cause of the problem is the lack of universal build specifications from the OE manufacturers. They don’t define what should be done when their products are remanufactured, and the market can fall into the trap of assuming it’s all the same. It’s just easier for people to look at a price, rather than the processes involved in top-quality remanufacturing. OE parts undergo a rigorous testing process before being approved, something that aftermarket alternatives certainly don’t do. The slightly higher price tag that comes with manufacturer approved products is well worth the assurance of quality. The new HyperDrive brand reflects the premium quality of our blended products and is a step forward for the Kerax lubricants division, which has historically been a predominantly private label. We’ve been delighted that customers have embraced HyperDrive so quickly. Some transmissions are £7-8,000: replacing a damaged one can cost more than an engine. There’s no cheap way of fixing them. With a standard automatic transmission fluid change, you’d be lucky if you get 60 per cent of the oil changed, so you’re always working on 40 per cent contaminated oil. With what we’re bring to the market, the minimum it’s going to change is 78 per cent. 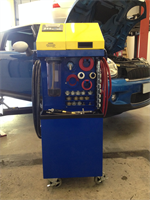 Half of our customers who already have the EDT machine have already said they also want an auto transmission decontamination one too. We want to encourage interaction between mechanics and the OESAA members present at the show so that they get a well-rounded perspective on the strides we are taking to drive industry standards upwards. It’s interesting to be at the beginning of the EDT journey with them. The industry has never seen anything like this before, certainly not anything which is capable of achieving these results and vastly improving motorists’ driving experiences. I personally don’t like engine flushes, but with EDT’s engine cleaner I can really see the benefit for customers. It’s a safety issue for me: I know in confidence that when I give the keys back to the customer they’ve had fitted what their car had fitted on the production line. So it’s key – it’s a must – to fit OE parts. In most instances, negative practices are the result of over-stretched technicians-turned-owners who lack the time to finesse their customer service practices. 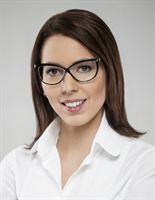 As a result, the quality of the work undertaken and the reputation of their business can be compromised. Having Andy Savva on the OESAA stand this year should prove to be a real talking point. His passion and enthusiasm for improving industry standards are infectious, and his real-world experience of using OE products wherever possible to help ensure that his business is successful gives even greater weight to the OESAA message. GISMO helps me keep a better track of our work load, helping me see when we have time to fit work in and preventing over-booking. It is also useful to ensure that we charge for everything connected with the job, and because it adds my preferred parts margin from an entered cost price, I know that we will always make money. Jo’s vast experience will be key in accelerating our network growth across UK franchises. We have already attracted some of the UK's top dealer groups including Perrys, Marshalls and Stoneacre, and with Jo leading the way we anticipate swift and exciting growth which will allow us to connect our motorists to even more great dealerships. I’m really excited to be part of such a dynamic team at such an important time for the business. The network has recently exceeded 2,000 garages – which boasts some very prestigious dealer groups – and AA Garage Guide has strategic partnerships in place with both the IMI and Motor Codes, so we have some strong credentials to build upon for the future. The components show that appearances can be deceptive. In some cases there’s a deliberate attempt to make copies look like the genuine OE part but without there being any serious attempt to match the construction or performance characteristics. FTE automotive GmbH is joining OESAA as we take further steps into the UK aftermarket” said Bo Marcusson, FTE Commercial Director Global Aftermarket. “As a leading German OEM manufacturer and the European leader in clutch hydraulic parts and remanufactured brake calipers, FTE plans to further expand in the UK aftermarket by offering distributors excellent supply and service. By partnering with leading OE specialist FTE, UK distributors will have access to profitable and growing market segments with limited competition. We welcome FTE’s decision to join OESAA as they seek to develop their UK presence. We look forward to working with FTE to ensure motor factors and garages are fully aware of the benefits of OE components, and understand the risks of alternatives sold as ‘matching quality’. 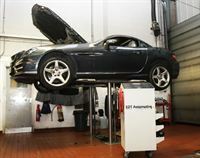 At AA Garage Guide, we strongly encourage garages to take proactive measures such as offering a ‘Spring Clean’ service, as they provide excellent touch points with customers and give the garage an opportunity to strengthen their customer service reputation. We want to work with the best UK garages: the ones that take the time to tailor offers and promote the benefits of regular car maintenance to their customers, whilst simultaneously delivering the highest levels of service to ensure vehicle safety and warranty-compliance. We have watched with interest the work done by OESAA in the UK to champion the benefits of fitting OE parts. The requirements placed on components increase more with every vehicle generation, demanding new technological improvements. As these cars reach the aftermarket there’s clear and increasing benefit in using OE parts to maintain the original performance of the vehicle. We’re already seeing a strong trend away from ‘cheap’ parts back towards genuine OE replacements in all markets where technicians understand the true benefits. We’re delighted to welcome GKN into OESAA. GKN is a global engineering business that works with vehicle manufacturers to develop leading-edge technologies so we’re certain their expertise can only strengthen our persuasive message for garages. The Automechanika exhibition is the perfect opportunity to demonstrate to a large audience the difference that quality OE products can make, by bringing them to life in a simulated garage environment. Vehicle and OE parts manufacturers invest hugely in research, development and rigorous testing to ensure the highest levels of performance, safety and compatibility. It’s a message that needs to be communicated widely as we find the most reputable garages – those who consistently deliver the highest levels of customer satisfaction – understand that technicians need to be fully trained, facilities need to be clean and presentable, and that reliable, OE components should be used wherever possible. I really want to see garages make sure that they are practising what they preach by imposing stringent maintenance checks and regular inspections on their air conditioning service equipment. We applaud the efforts that CompressorTech have made. They join a growing the number of suppliers that are investing in improving their Autocat data. Selling the wrong part because of inaccurate data presents a significant cost to motor factors. By striving to provide accurate, quality data, CompressorTech is demonstrating a clear commitment to supporting its customers. CompressorTech’s cross-referencing of part numbers is regarded as the very best in the industry, covering some 100,000+ part number references. CompressorTech also provides a ‘customers own unit remanufacturing’ service for the very latest part numbers not covered by the OEMs. This enables us to quickly add new to range data on a weekly or monthly basis. The application and part numbers are always up-to-date and mapped to MAM MMI Autocat V8, further endorsing the CompressorTech range. As a supplier, we want our distributors to maximise their sales opportunities by having the very latest part numbers available. We don’t want our distributors having to say to their customers, “It’s a Dealer part only”, and the power of Autocat V8 prevents this from happening. We understand the demands placed on small garages who lack the manpower to finesse their customer service practices. GISMO was developed with these businesses in mind, helping them to transition from ‘pen and paper’ garage management to a flexible and easy to use online system. This collaboration is born from a shared focus on quality: Motor Codes is committed to ensuring garages comply with the Chartered Trading Standards Institute-approved code of practice. Uniting with AA Garage Guide helps us to spread our message to consumers, supplying them with all the information they need to make educated decisions concerning the upkeep of their car. This platform also provides an excellent opportunity to promote our subscribed service and repair centres to a potential audience of several million car owners. CarVue, the cloud-based garage management system which helps garages save money and grow sales, has been enhanced with new stock management capability. CarVue already enabled garage staff to setup ‘products’ which could then be sold to customers, simply by picking them to be added to quotations and invoices. Now this popular functionality has been enhanced so that products can be marked as stock items, allowing a stock level to be inputted too. This stock level then simply reduces as the item is sold. The existing product capability already handled unit, cost and selling price data. The Original Equipment Suppliers Aftermarket Association (OESAA), along with leading industry training specialists ADS, will once again be hosting Autoinform LIVE – the UK’s biggest and best workshop training event. The 2016 event will once again be held at the state-of-the-art GTG Academy in Wolverhampton from 19-20 November, and is set to be bigger and better than ever. This year, to make it even more flexible for the event’s growing number of visitors, the show’s training sessions have been separated into three packages designed to streamline and improve the overall experience.